The 2009 Upstate Senior Classic was held April 27-28 at Fox Run Country Club. Long time club member Rob Johnson took the crown with a two day total of 143, one under par. Johnson shot even par 72 on Monday to take a two shot lead over fellow member Tommy Ashworth and Dean Gosnell of Pebble Creek. But with a solid 71 on the tournament's final day, Johnson stretched his lead and cruised to a five shot win, earning his first Greenville County Golf Association tournament title. Ashworth finished second with another 74 for a 148 total, while Roger Page of Links O'Tryon came back from an opening 77 with a nice par 72 to take third place. 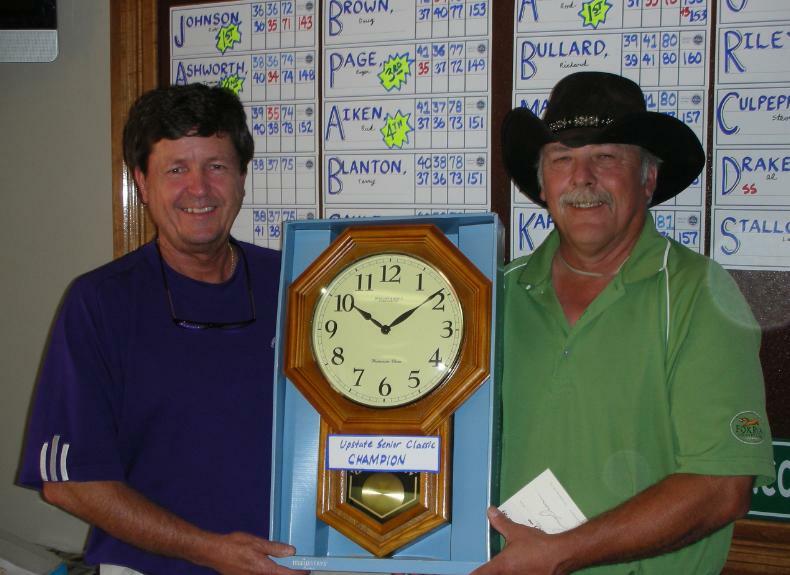 Links O'Tryon's Rodney Austin won the first flight, while Jim Thrift of Greer Country Club took the second flight. Fox Run member Al Drake won the Super Senior title. Drake, who is 79, came close both days to shooting his age in taking the age 65 & up honors. Thank you to all of the golfers that participated in the tournament and special thanks to Fox Run Head Professional Kurt Vogel and his staff for all the help! Mike Rogers wins Upstate Senior Classic! The 2nd Annual Upstate Senior Classic was held at the Greer Country Club. Mike Rogers shot a pair of 70's to win the championship. Dan Harvey won the Super Senior Championship. Thanks to everyone that played and made this a succuesful & exciting championship! The 2nd Annual Upstate Senior Classic is underway at the Greer Country Club. Doug Tooke and Joe Hamacher are tied for the lead after shooting 69. Mike Rogers (70) along with Donnie Gravley (71) and defending champion Doug Brown are in the hunt headed into Sunday's final round. Last year's Super Senior Champion Harold Brown and Bill Thorne are tied at 77 for that division. Click on the links below to see tee times for Sunday and first round scores. Doug Brown takes Upstate Senior crown! 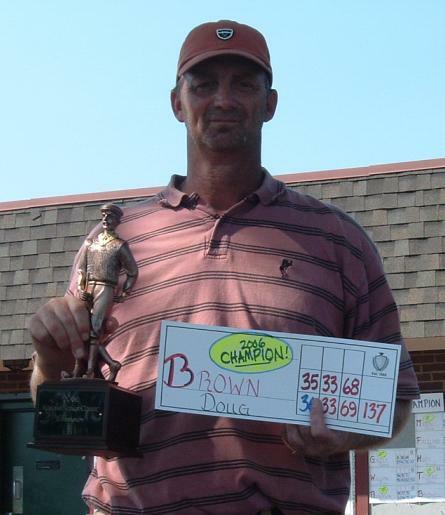 Doug Brown led from start to finish in the innaugural Upstate Senior Classic at the Greer Country Club. Brown followed his first round 68 with a 69 on Wednesday to post a 7 under par total of 137. Brown won by six strokes over 71 year old Harold Brown. Harold Brown, who shot two strokes under his age on Day 1 with a 69, finished up with a 74 and a 143. In third, Leland Crim (69), Doug Tooke (70), and David Mason (73), tied at 145. Two time Greenville County Am Champ Bobby Hines closed with a 70 to pick up 6th at 146. Doug Brown started out with a front none 36, and pulled away with his back nine 33 for his 69. Harold Brown captured the Super Seniors Division for entrants age 65 & older. Brown was followed by Bill Thorne & Ray Van Kirk. Leon Watkins 1st Annual Upstate Senior Classic Set to go! Gary Hucker has thought about it for a long time. He first contacted Greenville County Golf Association Director Robbie Gravley three years ago about reviving the County Senior Amateur tournament. Gravley was quick to say he'd love to have a senior championship, but that for a variety of reasons, interest had waned and the last two County Senior events had drawn small numbers. But Hucker persisted. "What are the reasons?" Gravley pointed out the large number of senior tournaments. He talked about the lack of a long standing tradition of the event, and finally talked about cost. Most seniors can play for very low dollars in their weekday events, but when you book a course on the weekend, the entry fee skyrockets and many seniors either can't afford it, or don't want to tie up a weekend. But still, Hucker persisted. "Well, let's fix some of that." Hucker encouraged Gravley to start a tradition with a new tournament, open to all Upstate seniors. He suggested a Friday-Saturday or a weekday event. And his company would help out with sponsorship money to fund the prizes until that "tradition" took over to make the tournament a "must play" event for Upstate seniors. Gravley said, "O.K. let's go for it." He contacted Greer Country Club Head Pro Ryan Lucas, who jumped on the idea. Lucas had thought for a long time that an Upstate senior tournament would be a hit. He negotiated a fair deal for the County Golf Association and volunteered himself & the Greer Country Club staff to help run the event. He even helped name the tournament, the Upstate Senior Classic. Lucas & Gravley decided that if the first year drew 50+ players, it would be a success. So far, Upstate seniors have blown right past that number, with 80 players set to tee off on Tuesday at Greer Country Club beginning at 9:00 AM. The 36 hole stroke play tournament will be flighted after the first round, and on Wednesday, the first Upstate Senior Classic champion will be crowned. Besides Hucker, other notables in the field are Bobby Hines, a two time Greenville County Am winner, Doug Brown, who holds the member course record at Greer with a 63, and former Upstate Mid-Amateur Champion Doug Tooke. "I am very excited that we got this thing off the ground, and very grateful to be able to help", said Hucker. "The guys that are running the tournament deserve a lot of credit. They put in the hours of work behind the scenes. I get to play golf!" So the new tradition begins Tuesday morning.